Genesis ToeJam and Earl in Panic on Funkotron (USA) "best ending" in 49:23.95 by Flip. 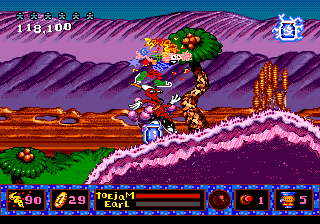 ToeJam and Earl in Panic on Funkotron is the sequel to the first ToeJam and Earl game for the Sega Genesis. Both games are well-known for their distinctive funk soundtracks. However, unlike the first game, which has randomly generated levels, this game is more of a conventional side-scrolling platformer. In this game, Funkotron has been invaded by Earthlings, and it's up to our heroes to fix the problem by capturing Earthlings in Trap-o-matic jars and sending the jars to Earth on rocketships. Early in the game, you'll see ToeJam visit a special area called the Hyperfunk Zone multiple times. After these visits, he has unlimited use of superjars, which require fewer throws to bottle enemies than ordinary jars do. This run gets the good ending by finding the 10 favorite items of Lamont, the Great Funkapotamus. All of the items are needed to get Lamont out of the Funk Dimension at the end of the game. The objects themselves are hidden in secret doors, most of which don't even exist until you've officially asked your friends for directions, but a few can be entered early without the need to trigger the dialogue.